Buyers looking for a home in East Hawaii will appreciate this new listing in Olaa Reservation Lots on N. Peck Road just off Hwy 11. Located at an elevation of approximately 2,100 ft. above sea level in an agriculturally rich area, this quality custom home sits on a 7.39 acre lot that already has an organic orchard planted with over 10 different types of trees including citrus, bananas, starfruit, cinnamon and clove. There is even a large stand of edible clumping bamboo growing on the property. 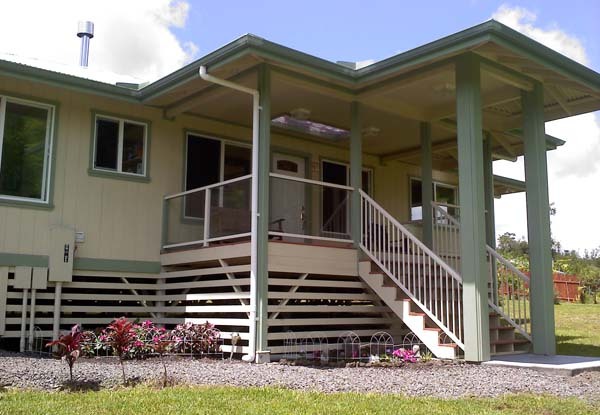 With paved county roads (and access to Hilo via Stainback Hwy), county water, available high speed internet and ocean horizon views, this beautiful property offers all the benefits of living near town, but with the added privacy and space that only a more rural location can provide. Designed and built by a contractor as his private residence, the home has all the “extras” — including an on-demand electric water heater and Energy Star stainless steel appliances. For more information about this listing, please contact me. At this price, this Mountain View home is an incredible value!